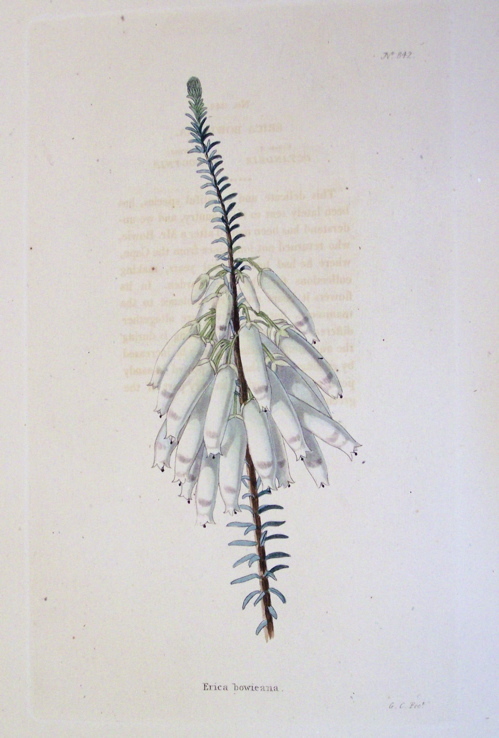 Hortus Camdenensis | Erica bauera Andr. Half-hardy, open, sparsely-branched shrub with blue-green leaves in whorls of 4 and terminal, pendant, compact pseudo-spikes of small white or pink flowers all year round. To 30cm. [RHSD, Hortus]. ‘This delicate and beautiful species, has been lately sent to this country, and we understand has been named after a Mr. Bowie, who returned not long since from the Cape, where he had been several years, making collections for the Kew garden. In its flowers it bears much resemblance to the mammosa, but the leaves are altogether different: its season of blooming is during the autumnal months.’ [LBC no.842/1824]. Introduced to Britain in 1822. [JD]. BF pl.21/1841. Only listed in the 1850 catalogue. It is possible that this plant, and others first listed in the 1850 catalogue, were part of an order for seed placed with James Carter, Seedsman and Florist of High Holborn on 8th April, 1846 [MP A2933-1, p.128], ‘some of the best varieties to complete the amount’. ‘Seeds of any of the Cape Heaths’ were also requested of Kew on 1st February, 1849 [MP A2933-1, p.177]. But see Erica nudiflora L. Although Erica bowieana is listed in both the 1830 and 1836 catalogues from Loddiges’ nursery held at Camden Park, it is not marked with a ‘c’ in the 1836 edition, indicating grown at Camden [CPA]. This perhaps reinforces the suggestion that it was obtained as seed from Carter’s, although it may have been a later acquisition from Loddiges’ nursery.